We specialize in offering Antique Marble Gold Painted Flower Vase which meets the specific needs and requirements of our customers accordingly. The offered range of Marble Flower Vase is made utilizing high grade raw material and in strict compliance with the international quality standards. These are available at industry leading prices. Paypal by your credit card. We make available a variety of Marble Gold Painted Elephant all of which stand high on quality and creativity. We are enlisted with the chief Manufacturers, Exporters, and Suppliers of Marble Elephant from Agra, India. These Marble Gold Painting Elephants, we offer, take original designs and exude immense aesthetic appeal. They are made of pure marble and are durable. And, to top it all, they are available at modest prices. Clients can avail from us elegant and royal looking marble table tops. These stone & marble handicrafts corporate gifts are available in different designs, sizes, shapes and colors and at cost effective prices for office and table utility gifts. We have for our client’s wide range of marble gifts, marble corporate gifts set. These vases are precisely designed in different sizes and is offered at industry leading prices. Further, we ensure our clients that the offered product is strictly checked by our experts in compliance with the set industry standards. 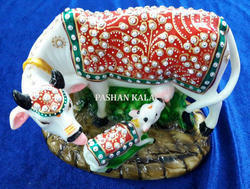 We can meet the over growing requirement of our clients by manufacturing and supplying a comprehensive range of Marble Gold Painted Kamdhenu Cow. Our organization can also facilitate our clients from all over the world by providing them many other products. We offer product at par with the international standards. We can meet the over growing requirement of our clients by manufacturing and supplying a comprehensive range of Marble Gold Painted Plate. Our organization can also facilitate our clients from all over the world by providing them many other products. We offer product at par with the international standards. 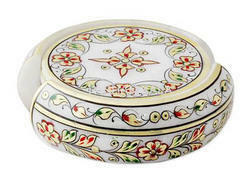 The offered range of Marble Gold Painting Planter is made utilizing high grade raw material and innovative techniques in strict compliance with the international quality norms and standards. 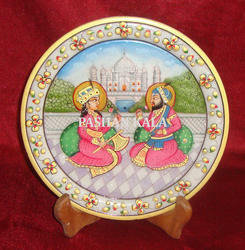 These products are best suited for Home Decoration, Wedding Gift, Simple Gift Purpose and Showcase. 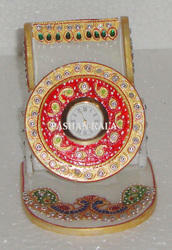 Our offered Marble Gold Painted Mobile Holder is carved out by our expert using best in class marble in accordance with set quality norms. This Marble Mobile Holder is quality checked on several parameter by our quality expert so as to dispatch flawless range at customer’s end. The offered range of Marble Painting Coaster is made utilizing high grade raw material and innovative techniques in strict compliance with the international quality norms and standards. 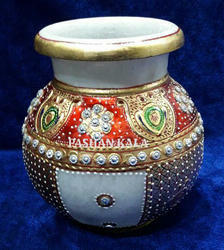 These products are best suited for Home Decoration, Wedding Gift, Simple Gift Purpose and Showcase. 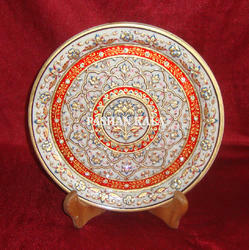 Looking for Marble Gold Painting Handicrafts Items ?